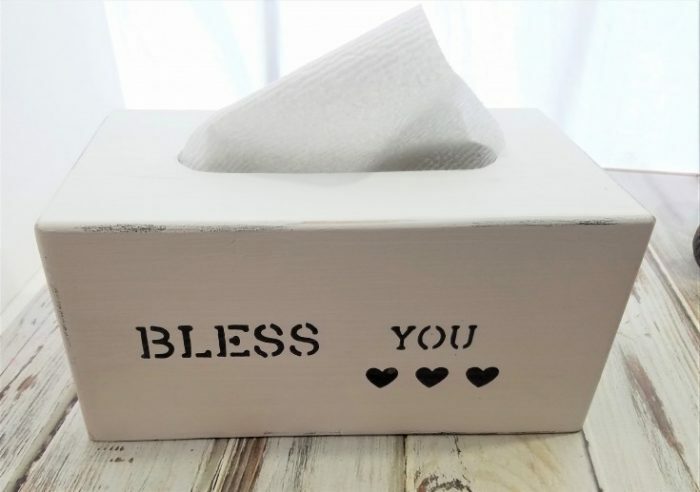 I have two tissue box covers that I will be sharing. 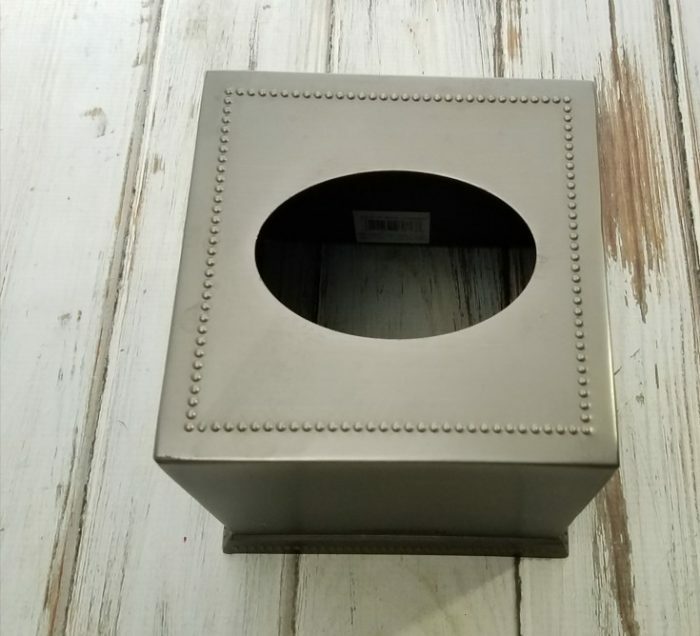 The first one is going to be a makeover of a metal tissue box cover that I picked up at Goodwill. It is for the small square box of tissues. First, I washed, and dried the tissue box cover. Next, I gave it two coats of white chalk paint, letting each coat dry thoroughly. After that I stenciled in the lettering for Bless You, and the design using black chalk paint. Once thoroughly dry I took it outside and gave it a light sanding to take off some of the paint on the edges, and on the small dots on the very top, and around the bottom of the tissue cover. 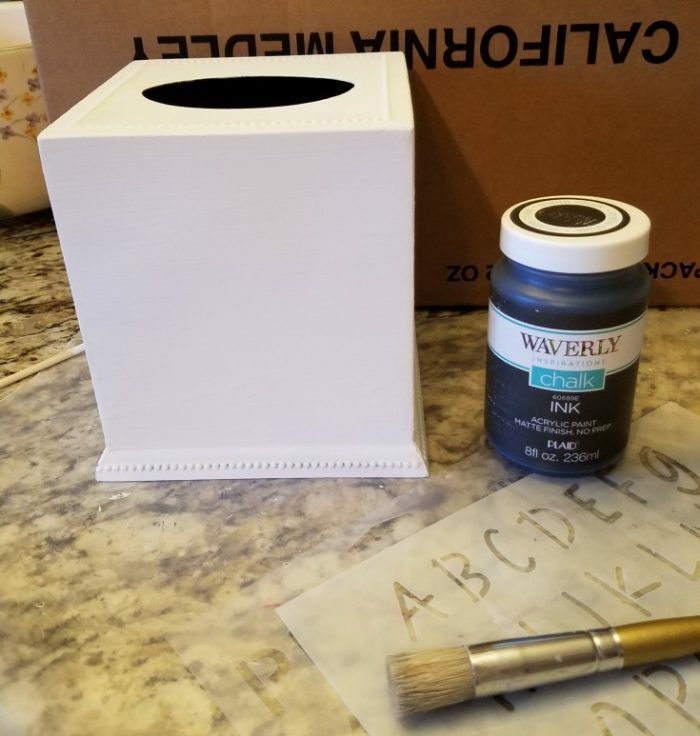 Then I brought it back in and using just a little black chalk paint I smeared a dab of black on some of the edges and sides of the farmhouse style tissue cover. 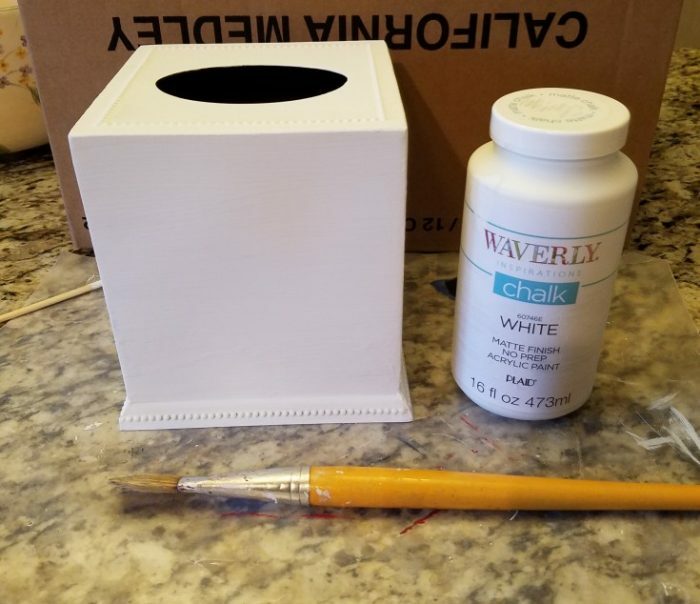 Now just place the cover over top of the square tissue box, and your good to go. 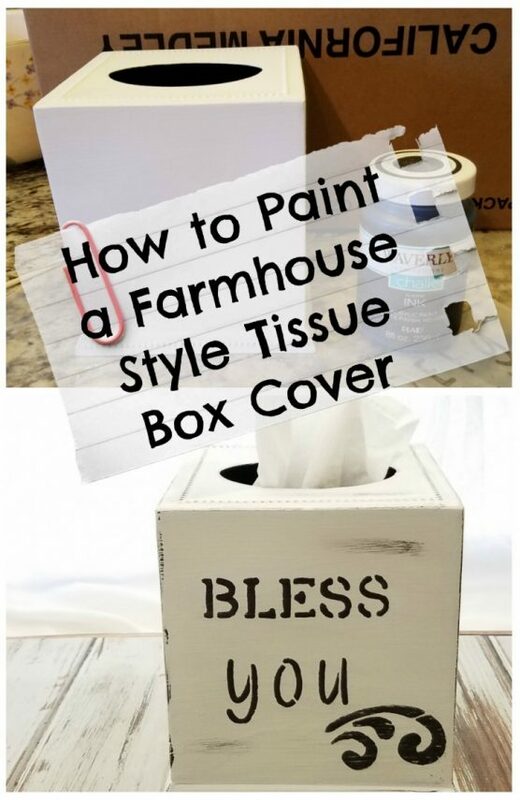 Diy tissue box cover – farmhouse style. 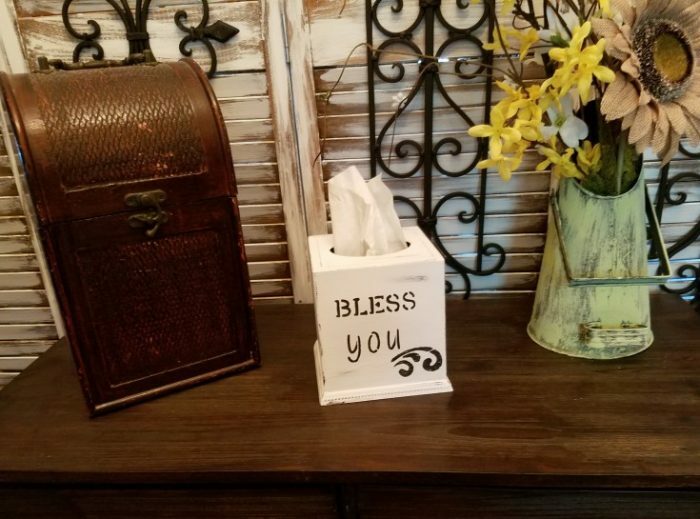 This tissue box cover I purchased at Hobby Lobby, and it is made of wood. The bottom slides out to put the rectangular shape tissue box inside covering it completely. 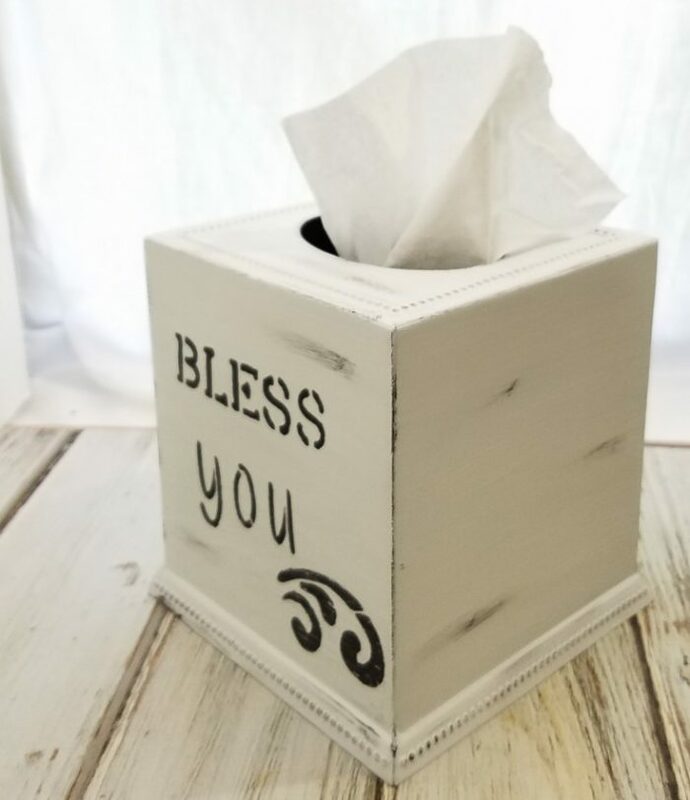 For this farmhouse style tissue box cover, I painted it the same as the one above except I used different font stencils, and added hearts instead of the design. Linda these are both so much nicer than the generic holders we see at the stores. I think that the black really adds a sweet touch to the over all look. I hope you are feeling better. Have those chiropractic sessions helped at all? Thanks Mary! I am really happy how they turned out! Thank you Wendi! I’m really happy how they turned out, and they were so easy. Thanks so much for pinning! Those are so darn cute! 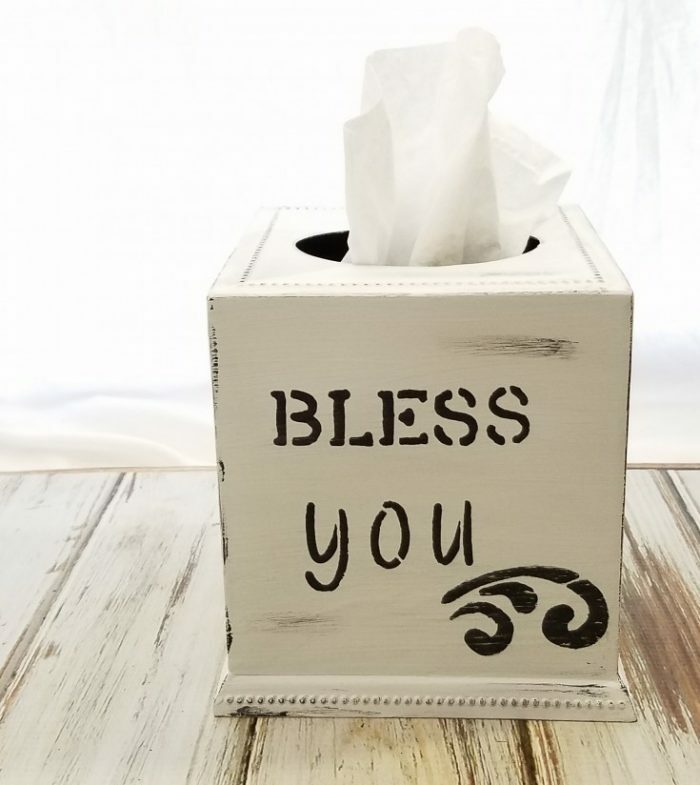 I love them & haven’t seen painted tissue box covers yet. You did a good job. Pinned. Thank you Florence! I got the idea when I ran across a plain metal cover at Goodwill. Thanks so much for pinning! Thanks Michelle! I love how they turned out! Thanks Nikki! They would be the perfect gift for teachers, and it is the season. I love these, and I wish I had seen this a week or two ago. 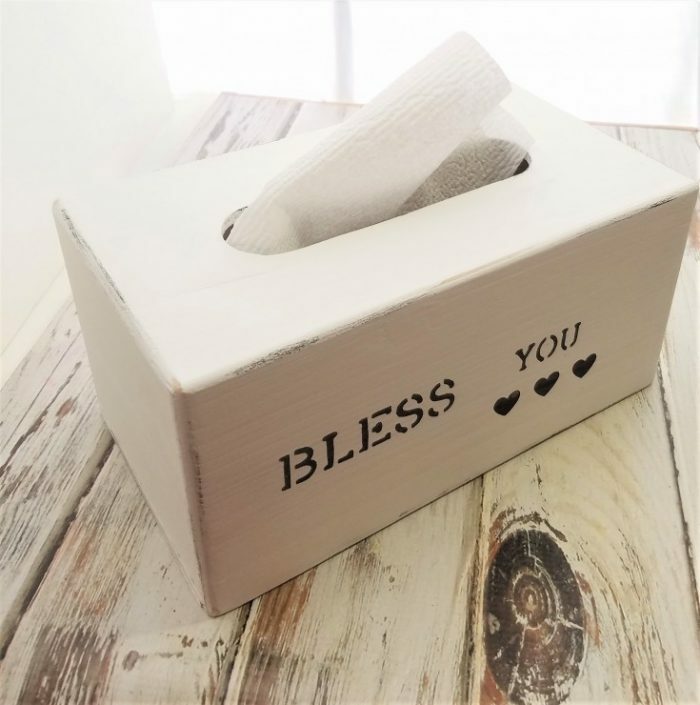 I just bought a tissue box cover for my daughter’s room… I will keep this in mind for the future though! They look great! Thanks Amy! This is such a easy project, and i love how they turned out. Hobby Lobby does sale the large tissue cover, but have’nt found anymore of the small.